Of course, not all books for children are illustrated and most books which have been produced principally for their illustrations are not of interest to children. Nevertheless, there is enough 'crossover' in these two subjects to make the combination sensible. 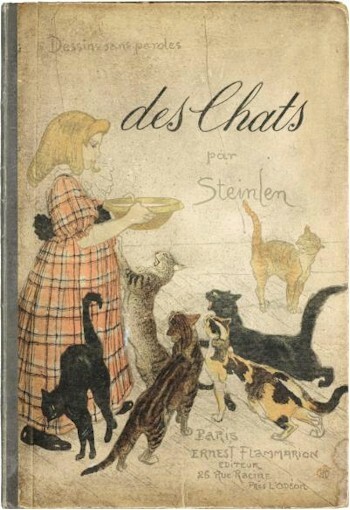 This copy of 'Des Chats' by Steinlen (BK9/84), which sold for £75 in 2013, is typical of the antique books being sold in our auction rooms. Children's books are an enormously popular area of collecting. They take you back to the happy innocent years of one's own childhood or even allow you to immerse yourself in the mores and fantasies of children of an earlier age. You can choose from the simple moral stories of the Victorian era, often accompanied by charming illustrations, to the more robust fiction of the Harry Potter era. Works for children dating from the pre-19th century are rare indeed, but occasionally delightful (usually specifically educational) examples do surface. There is a view that children's literature became something to take seriously with the publication of Lewis Carroll's Alice's Adventures in Wonderland in 1865. It reflected some of the values manifest in Edward Lear's Book of Nonsense published some twenty years earlier as well as the world of Topsy Turvy so dear to WS Gilbert and his Savoy Operas. 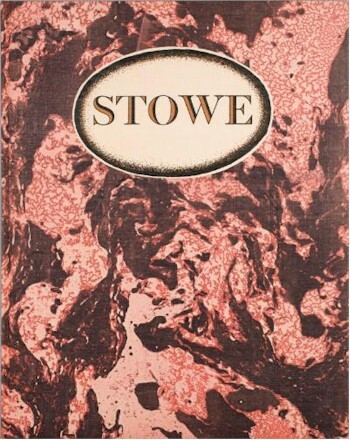 A limited edition of 300 signed copies of John Piper's Stowe with colour lithographs published by the Hurtwood Press in 1983 (BK9/75) fetched £450 in the Children's and Illustrated Books section of the February 2013 Rare Book sale. This brand of ridiculousness clearly struck a chord with the Victorian sense of humour, being essentially moral and respectable, yet playing havoc with the reader's expectations of the world. All harmless fun. Much late 19th and early 20th century children's literature was heavily influenced by Britain's role in the world and her vast colonial empire. Tales of bravery and derring-do populated by plucky young men faced with primitive savagery abounded, with the good Christian hero always winning in the end. A foremost proponent of this genre was George Alfred Henty, a prolific author whose early editions were usually bound in 'picture cloth' (ie: cloth-covered card embossed with an image from the novel and enhanced with colours or gilt). This was a popular style of binding and examples in good condition are rare and quite collectable. It was in use for other genres as well, notably compilations of poetry. The famous Boys Own Annual (to which Henty contributed) and indeed Girls Own Annual also reflected these values and appeal to the same market. There is also an active market for children's annuals throughout the 20th century from Chatterbox via The Eagle to The Beano. As with all books, condition is important and is particularly noted with children's books, which were rarely treated carefully by their first owners. This makes the discovery of copies in pristine condition so exciting, although you can't help wondering how much fun their original juvenile owners were allowed! Other names to note in this genre are, of course, The Rupert Bear annuals, which remain firm favourites, with the 'Brown Face' 1973 edition being the Holy Grail (withdrawn after the release of only a handful of copies and currently selling in excess of £10,000). Even if your 1973 Rupert has a white face, these annuals can fetch £40+ depending on their age and condition, but you do have to watch out for later facsimiles. Many popular characters from 20th century children's literature have also appeared in 'annual' form (excellent Christmas presents) including Billy Bunter, Noddy, et al, but annuals derived from cinema and television are common and can be collected at reasonable prices: Mickey Mouse, Shirley Temple and Blue Peter are amongst this diverse group. Books which are loved as much for their illustrations as their stories are a popular feature of this category and the works of Beatrix Potter probably take pride of place with first editions with dustwrappers commanding good prices. Equally names such as Edmund Dulac, Arthur Rackham, Randolph Caldecott and Walter Crane all attract collectors' interest.